Everyone’s favorite marmalade-loving bear is back for seconds in Paddington 2, the sequel to the film that utterly charmed me back in 2015. 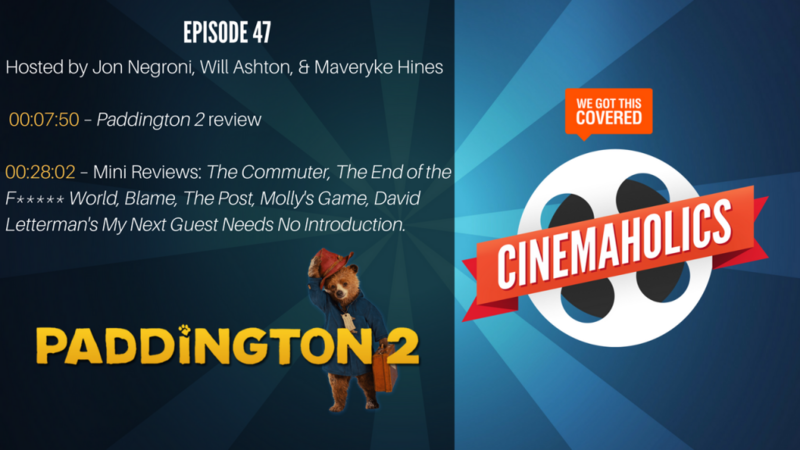 On the show this week, I review the film with cohosts Maveryke Hines (who never saw the original) and Will Ashton. The movie has an incredible 100% review aggregate on Rotten Tomatoes, but that doesn’t mean everyone on Cinemaholics agrees. In our Mini Reviews segment, we covered a lot of other movies and shows you might want to check out. Will reviewed The Commuter, starring Liam Neeson. Maveryke and I talked about the The End of the F****** World, a binge-worthy new show on Netflix. Will recommended Blame, an indie gem directed by Quinn Shephard. Then we both dug into The Post, Molly’s Game, and My Next Guest Needs No Introduction with David Letterman. We also talked at length about the Golden Globes this week, but less about the actual awards and more about the impact of the MeToo and TimesUp movement, plus our plan to take part in the 52 Films By Women Challenge.